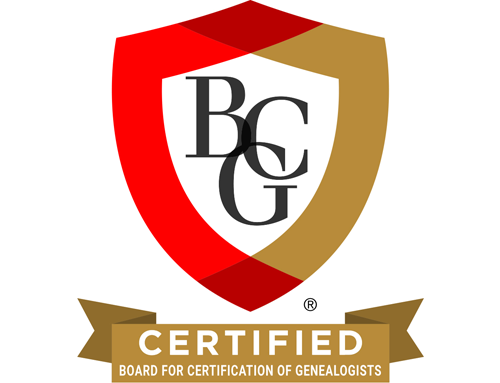 The Board for Certification of Genealogists congratulates Beth Stahr, CG® for her essay “Preparing for Genealogical Reference Work,” a chapter in the newly released publication Genealogy and the Librarian: Perspectives on Research, Instruction, Outreach and Management. In 2014, Beth conducted an online survey of librarians or other staff who worked in genealogy collections or archives. The survey revealed almost 68% of respondents had no formal genealogical education, and 44% had no formal genealogical librarian education. In 2017, a follow-up survey asked U.S. and Canadian master’s degree programs accredited by the American Library Association if they offered a course in genealogical reference services. Only 20% reported that they offered a course, and it was always an elective. In her essay, Beth reports these results and identifies options for continuing professional education opportunities for librarians who work with genealogists. Beth Stahr, CG®, M.A., M.L.S. is an academic librarian who has a special interest in promoting formal genealogical education for librarians.